Here are some interesting green gifts for the hard to shop for person on your list. 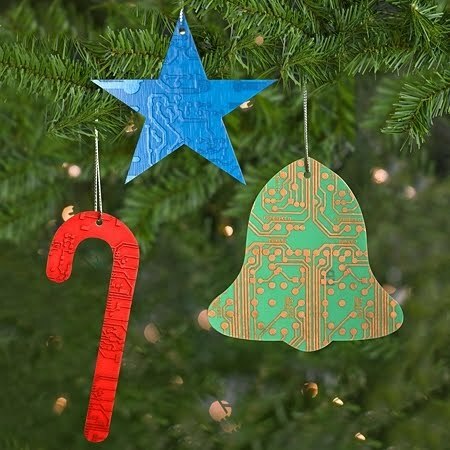 Motherboard Gifts is a company that utilizes old motherboards and computer parts to make fun and useful reclaimed gifts: business card cases, money clips, picture frames, clocks, coasters, jewelry, bookmarks, binders, and even Christmas ornaments. These are eco-friendly gifts even the most tech savvy, computer geek may love and most are under $30 like the business card cases, CD clock, money clip, clip boards, picture frames and many other fun, recycled gifts. Eco-Artware is “your one stop gift shop for all things beautiful, well made and environmentally friendly.” They offer a huge selection of handcrafted, green, and recycled artwork. 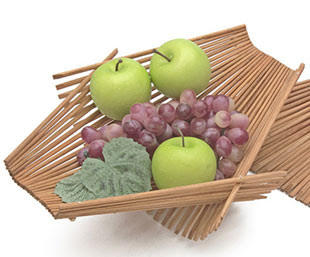 You are sure to find something for anyone on your list at Eco-Artware. Some of the gift items to choose from include: jewelry made from old pennies, typewriter keys, and watch faces; bowls made from old records and signs; coasters made from old unplayable vinyl records; and baskets made from chopsticks in addition to many other fun recycled and Upcycled gifts. 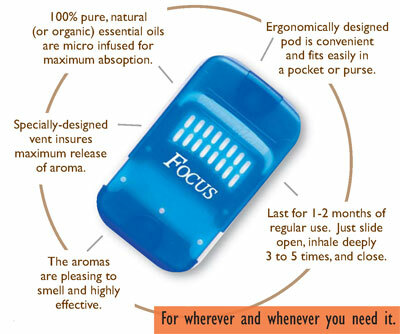 Aromapods are a new simplified way to experience aromatherapy. Aromapods deliver essential oils directly to the nose with an inhaler that’s smaller than a credit card and will fit conveniently in a pocket or purse. All you have to do is slide it open, inhale deeply 3 to 5 times, and close. They are available in 24 different blends including Calm, Energize, Focus, Diet Aide, Lavender, and Peppermint, and in relief formulas for Headache, Sinus, Cold & Flu, Insomnia and PMS. 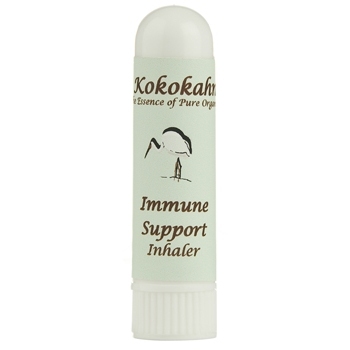 Kokokahn also offers aromatherapy inhalers in little tubes (remember the little Vicks inhalers we used to always carried around when stuffed u, that’s how these are made). These aroma packed tubes put the scent right where it needs to be-directly to your nose. These highly scented tubes come in three powerful formulas: Stress Relief, Immune Support and Emotional balance. Kokokahn also has a fabulous selection of bath and body products for under $30 including body scrubs and body balms. EcoSumo has a wide variety of eco products-clothing, household products, cleaning products, even furniture and pet products. 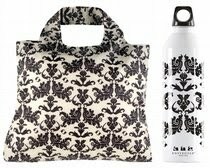 Some of their items are under $30 including the Reusable Bag and Bottle Combo sets which feature an EnvioSax reusable bag and a matching stainless steel 20 ounce Skinny bottle. The fun and funky prints are sure to please someone on your list. I really love La Boheme Combo 1 which is a black and white print with lacy, black almost paisley like designs on an off-white background. 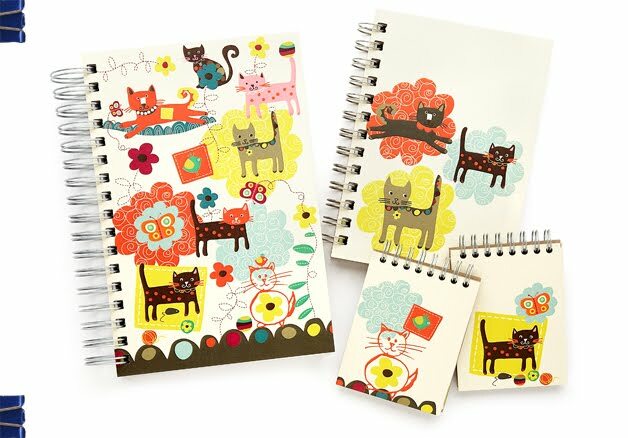 For the writer or sketcher on your holiday list consider ecojot notebooks and sketchbooks made from 100% post consumer waste with chlorine free and acid free cover boards. They also use vegetable based inks and glues for a truly eco product. 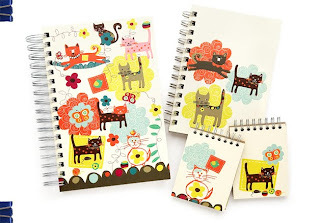 With fun designs and funky colors these little books are sure to inspire. Ecojot products may be found in a store near you or at one of these online stores. EcoBags are the original reusable bag and have been in business since 1989. I love, love, love their classic string bags. I walk around throwing everything in them, even though they were designed to be used for fresh produce. I just adore them. They can hold up to 40 pounds and are made from 100% organic cotton. Bring it in a Bag is another company that offers stylish reusable and eco-friendly bags. 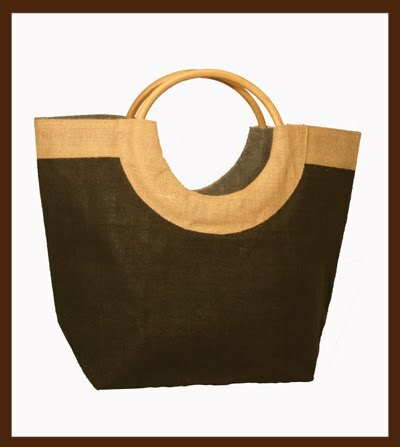 Check out their round totes made from natural jute. They are stylish and can be used for anything. I rarely leave home without my black with natural trim large round tote. 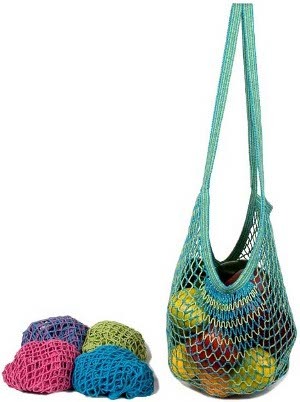 They also have mini round totes to match the large bags, they would make such adorable little handbags. 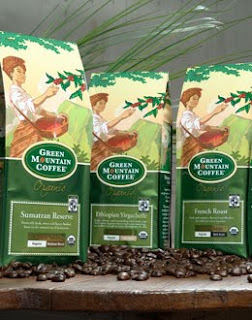 For the coffee lover on your list check out Green Mountain Coffee’s assortment of ethical, fair trade and organic coffee selections. They have an organic sampler pack perfect for holiday giving that contains: Organic Ethiopian Yirgacheffe, Organic French Roast and Organic Sumatran Reserve. 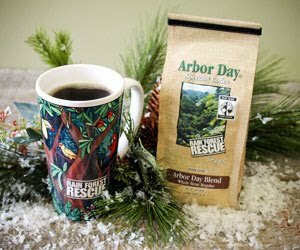 Another fabulous coffee gift is the Rain Forest Rescue Gift Set from the Arbor Day Foundation. This is one of those wonderful gifts that gives back by supporting the Arbor day Foundation. Got a tea lover on your list? How about specialty teas from Teatulia? They have whole leaf tea pyramids bags in lovely eco-friendly canisters. 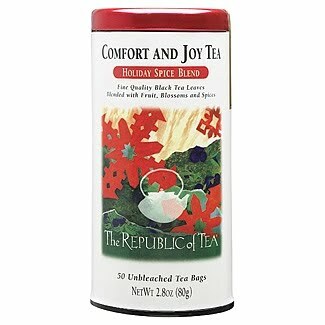 For a huge variety of flavored teas check out The Republic of Tea, they have the largest selection of flavors I have ever seem. Pomegranate Vanilla, Holiday Spice, Cinnamon Vanilla…I’m already hooked on these delicious teas. 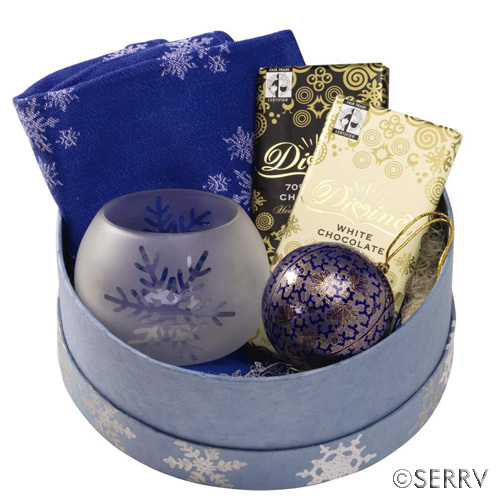 They have their everyday selections along with some nice samplers and gift sets for the holidays. Looking for something a little stronger than coffee or tea? How about a bottle of wine? 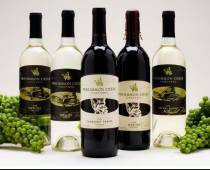 Persimmon Creek Vineyards offers quality wine made in the mountains of Northeastern Georgia. Everything is still done by hand: planting, pruning, harvesting, and bottling- all the old fashioned way for high quality Riesling, Merlot, Cabernet Franc, Seyval Franc, and Icewines. For the chocolate lover on your list consider Divine Chocolate. These delightful fair trade chocolates are truly divine. They have a variety of chocolates and gifts for the chocoholic on your holiday list. For the chocolate lover who enjoys something a little different check out Original Beans. They have a few chocolate bars in unusual flavors- dark chocolate mixed with mulberry, or cognac, honey, even sea salt. This is truly exotic cocoa. 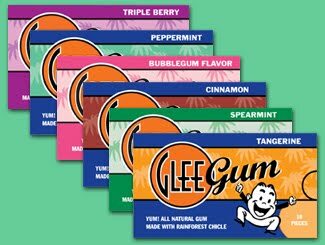 For the kiddies on your list who may like something sweet but aren’t really into the exotic chocolates consider Glee Gum. Glee Gum is all natural chewing gum with no artificial colors, flavors, or sweeteners. A perfect gift for kids is the make your own chewing gum kit. Kids can learn while having fun. Green Christmas: How to Have a Joyous, Eco-Friendly Holiday Season by Jennifer Basye Sander, Peter Sander, and Anne Basye is the eco-Christmas guide book to help you get through the holidays in green without seeing red. From decorating to shopping for gifts, to throwing holiday parties and even cleaning up afterward- this wonderful little book will help any eco-minded person streamline the holidays. Make this season more meaningful with the help of Green Christmas, and if you want to help others have a more eco-holiday season this book will also make a great gift. 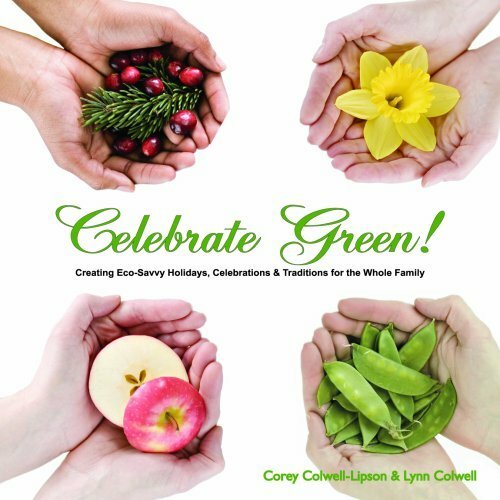 Celebrate Green: Creating Eco-Savvy Holidays, Celebrations and Traditions for the Whole Family by Lynn Colwell and Corey Colwell-Lipson is another fabulous book that can help you make all of your holidays and celebrations green. Not only will it help you get through the winter holiday season it will help you green all of your celebrations throughout the year. And it makes a fabulous gift. I’m Dreaming of a Green Christmas: Gifts, Decorations, and Recipes That Use Less and Mean More by Anna Getty is a really great green Christmas book full of crafts, how tos and fabulous advice. 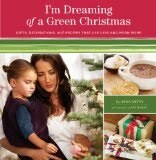 This is one of the best green Christmas books I’ve come across, it can help make your Christmas meaningful again. 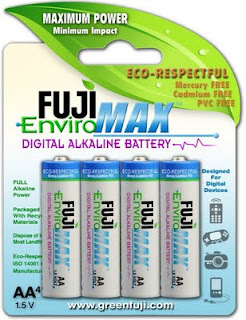 If you are purchasing gifts that need batteries make sure to go green in that department as well by getting rechargeable batteries or the new Fuji Enviro Max batteries which are mercury free, cadmium free, PVC free and packaged in recycled materials. If you like recharagable batteries check out PowerGenix PGX1HRCH-4AAZiNc-1.6v 4-Position Charger with 4 AA High Voltage 1.6v 2500 mWh ZiNc Rechargeable Batteries it delivers an efficient & fast charge at a great value. 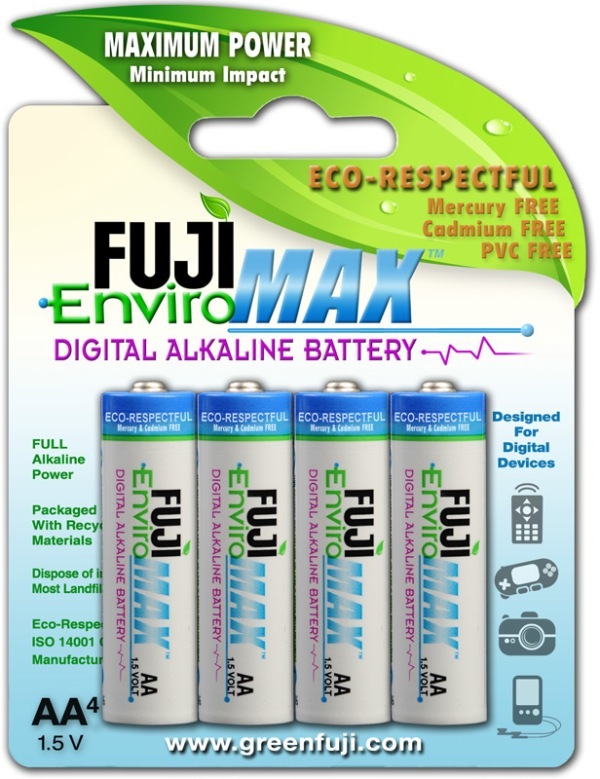 You can charge two AA or AAA NiZn batteries in 1 to 1.5 hours, or charge 4 AA batteries in about 3 hours. The PowerGenix Quick Charger is intended for use with eco-friendly NiZn batteries only. Previous article Attention All Organic Glamazons :: Organic Glam Makeup Has Arrived! With the festive season of Christmas closing in many of us take the calm organized approach in knowing exactly what your loved ones and friends wish for. The gifts are probably already wrapped, tagged and stored away, waiting for the 25th to hopefully bring a little joy and big smile to the recipient’s face. Others find this yearly ritual stressful and are probably too busy with their hectic life styles that for them the best way to cope is to do the mad dash for gifts on Christmas Eve. Whichever method of choice works best for you, there is still that decision in making your selection a fitting one for the lucky person in question. Once those gifts are purchased it’s just fingers crossed that duplicate items from other folk are not making their way under the tree. We all want to give and receive something special and different, not the run of the mill pair of socks that you mischievously rewrapped for your dad as an extra little prezzy. Don’t forget Fierce Hugs organic baby clothing — adorable organic cotton onesies and organic t-shirts for toddlers at 35% off for Cyber Monday. Use code BLACK35 until the end of November 30th. Our clothes are made with fair labor and designed by indie artists for original graphics like the Confused Cloud baby tee! Happy Holidays! I am in search of some good gifts. I think the above mentioned things are very economical. I like them.